AFTER he had sailed round the world in the old English cutter Firecrest, Alain Gerbault, the French yachtsman, linguist and lawn tennis player, had a new yacht built for him and sailed single-handed back to the Pacific. There he took up his abode among the Polynesians. In two of his books, The Flight of the Firecrest and In Quest of the Sun (Hodder and Stoughton), Gerbault tells the story of his world voyage and reveals part of his character. His attitude towards life is the opposite of that expected of the conventional Frenchman, as Gerbault states his decision to avoid cities and to lead the plain life of the sailor and bathe body and mind in sunshine. A MODERN ULYSSES. Gerbault photographed at Suva, in the Fiji Islands. Tired of cities and civilization, this intrepid amateur sailor set out to find solace on a voyage which took him round the world. His imagination and sensitiveness isolated him at school, but he found that the sea offered solace. His father owned a yacht, and Gerbault made friends with the children of the Breton fishermen. He dreamed of the day when he would own his own boat. Gerbault’s imagination was fired by reading books about the sea, and even during the war of 1914-18, when he was an aviator, he longed to be afloat. He and two comrades decided to buy a yacht and sail her round the world. As it happened, the two friends were killed, and after the war Gerbault decided that he, the survivor, would carry out the voyage alone. He had been trained as a civil engineer, but abandoned his profession and began to look for a yacht that he could handle by himself. 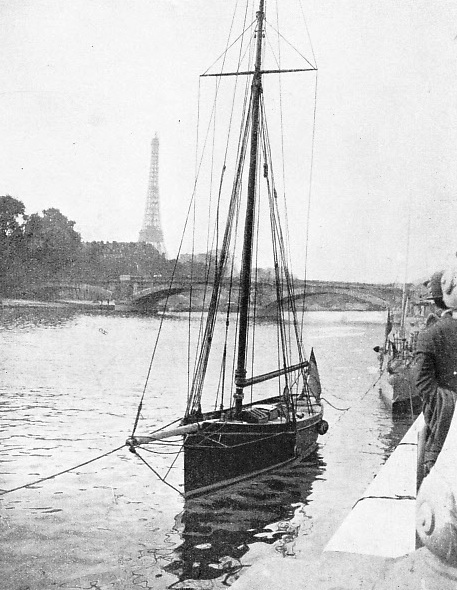 After having searched in France for a year Gerbault crossed the Channel. He found the Firecrest near Southampton and bought her. 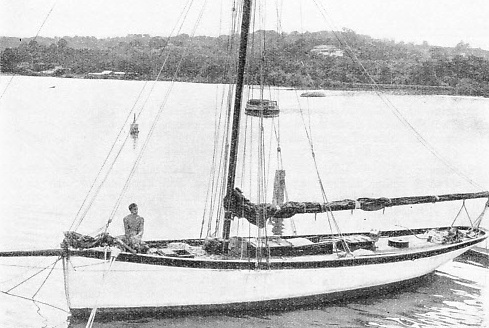 The Firecrest was the type of yacht that few experienced cruising men would have selected for a blue-water cruise, but Gerbault was enthusiastic about her, and rightly so, for she did all that he asked her to do. The Firecrest was a racing cruiser, designed by the late Dixon Kemp, and built by P. T. Harris at Rowhedge, Essex, in 1892. Her overall length was 39 feet, her length on the water-line 30 feet, her beam 8 ft 6-in, and her draught 7 feet. She had a lead keel weighing three and a half tons, with another three tons of inside ballast. The Firecrest was flush-decked, with a companion-way, a hatch forward, two skylights and a sail-locker hatch. A 6-ft canvas folding dinghy was carried folded on deck. The yacht was built of oak and teak. Her accommodation was divided into three compartments - forecastle, saloon and the cabin aft. This sleeping cabin had two bunks, with lockers under them, a wash-basin with a fifteen-gallons water tank and book-racks. The saloon had lockers and a folding table; the forecastle contained two folding cots and the galley. Gerbault cooked on a paraffin pressure stove hung on gimbals to counteract the roll of the yacht. His other two water-tanks were forward, and he stored provisions in the lockers. Light was provided by an oil lamp and by candles hung on gimbals. He preferred the cutter rig to that of ketch or schooner on the ground that he found it easier to reef than to furl sails and because the cutter rig gave him the maximum efficiency for his needs. Gerbault took the Firecrest to the Riviera. She was tested by gales in the Bay of Biscay during this passage, and fully justified his faith in her. He spent more than a year cruising on the Riviera with an English boy for shipmate, playing in lawn-tennis tournaments. 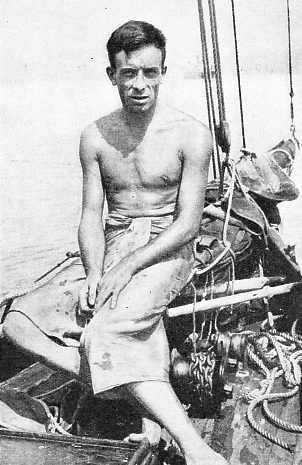 He set out single-handed from Cannes in April, 1923, for the first stage, a sail to Gibraltar, when he felt sure he was fit to stand the physical and mental strain. At this period Gerbault carried a squaresail and ran before a gale, logging thirty miles in three hours, an exceptional run for a boat only 30 feet on the water-line. With such an unusually narrow yacht the single-handed sailor found the task of getting in the squaresail dangerous, as he appears to have made the mistake of carrying on too long before a rising gale. The yard of the squaresail was 20 feet long, and in trying to get it down Gerbault found that the lee-end touched the water, and he nearly went over the side. It took him over an hour to get sail and yard stowed on deck, and the experience was such that he vowed never to use it again. He had then had sixteen hours at the tiller, and was glad to heave to for the night. AFTER 24,000 MILES. A photograph of Alain Gerbault sitting in the bow of the Firecrest after his arrival at Suva. The Firecrest, which had suffered considerably on her voyage through bad weather and running aground, was hauled up on a slipway at Suva, where some necessary repairs were made. After having left here the yachtsman sailed west to New Guinea, and then passed through the Torres Strait, north of Australia. The old-fashioned plank-on-edge type of cutter naturally proved hard on her gear in a storm in the turbulent Mediterranean. Gerbault had scarcely started before he was busy with repairs. He had roller-reefing on his mainsail, and the gooseneck of that broke; a topping lift parted; and then his jib halyard gave way and spilled the jib into the sea. He saved the sail at the risk of his life. When the gale ceased, a period of light airs and calms ensued that lasted for nearly three weeks, and it was not until May 15 that Gerbault anchored at Gibraltar. He had a well-stocked library aboard, and, more important, had the right temperament for enduring protracted calms. This gift of patience is essential for the deep-sea cruising man, and unless he possesses it he will subject his nerves to a strain that will be greater than that imposed by a gale. Some of the dockyard “mateys” at Gibraltar still remember the state of the Firecrest’s gear when she arrived; it was certainly in a bad condition. Everything was put right, however, and in a few weeks Gerbault prepared for a non-stop sail from Gibraltar to New York. It was an ambitious effort, as no one had attempted the east to west passage non-stop and single-handed before. In addition to the necessity of overhauling the vessel before embarking on such a trip, there arose the important problem of food and water. Gerbault took aboard the following supplies: 80 gallons of water, 80 lb of salt beef, 60 lb of ship’s biscuit, 30 lb of butter, 20 lb of bacon, 24 pots of jam and 50 lb of potatoes. He left Gibraltar on June 6, and was fortunate enough to find enough wind to blow him clear of the Rock, so that at night he saw the Tangier light. Then the wind, which had increased to gale force, veered right ahead, and blew his jib to pieces; therefore he reefed his mainsail and hove to under that and the foresail while be turned in for the night. Next day he had more trouble. The patent roller-reefing gear, which had been repaired at Gibraltar, failed because of a fracture; and the mainsail began to part at the seams; thus before he was two days out of Gibraltar he was busy repairing his mainsail. He passed Cape Spartel, the African corner of the Strait of Gibraltar, and gained the open Atlantic, picking up the trade wind on the third day. Noon observations showed Gerbault that the Firecrest had covered fifty miles in the first two days from Gibraltar. Considering the strong set of the currents into the Mediterranean from the Atlantic, and in view of the fact that he had left the yacht to herself at night, he had done fairly well. When he settled down to run before the trade wind, he found that the design of the Firecrest needed a hand at the tiller all the time; thus he steered for twelve hours, after which he hove to and went below to sleep, turning out at five o’clock in the morning to cook breakfast. This consisted of porridge, bacon, ship’s biscuit and butter, and tea and condensed milk. In common with most other yachtsmen who have cooked in the forecastle of a small yacht, he found that the roll was too much for the gimbals, so that whatever was on them occasionally rolled off. ROUND THE WORLD. The course of Gerbault’s voyage is shown on these sketch maps. He began his trip when he left Cannes, in the French Riviera, in April, 1923, and ended it when he reached Le Havre in July, 1929. 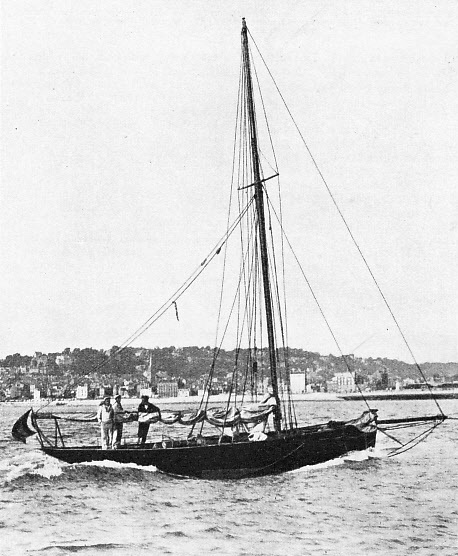 The Firecrest, an English boat, was built at Rowhedge, Essex, in 1892. Her overall length was 39 feet, her length on the water-line 30 feet, her beam 8 ft 6-in, and her draught 7 feet. The yacht, which Gerbault bought near Southampton, was built of oak and teak. Her accommodation was divided into forecastle, saloon and cabin aft. This vessel weathered all the storms and gales of the ocean and her name will never be forgotten by yachting enthusiasts. The need for constant steering necessarily added greatly to his labours, and before long he had more trouble with his gear. The bobstay, running from the end of the bowsprit to the stem, broke, and he had to go out to the end of the bowsprit to repair the wire rope. Then the foot of the mainsail ripped. In the neighbourhood of Madeira, which he did not sight, the trade wind fell off. During the calms that followed, Gerbault experimented with his sails and found that by furling the mainsail, setting the trysail and trimming the jib in flat he could get the Firecrest to hold her course unaided by the tiller. He was therefore able to sail round the clock, although the speed under this rig was not as good as that under the full mainsail: thus freed from the tyranny of the tiller he was able to enjoy life a little more. When Gerbault had been at sea for a month he found that the bulk of his water had gone sour. He carried fifty gallons in two new casks that he had bought at Gibraltar, and this had gone bad. Only half of the thirty gallons he had stored in galvanized iron tanks remained; thus he had to ration himself to half a glass of water a day. When the wind came again his sails kept ripping; and then his salt beef began to go bad. This happened when he had about 2,400 miles to sail. Before long, various parts of the wire rigging gave trouble. Gerbault found that for many purposes rope is better than steel wire, because rope will bear jerks and jolts much better than wire. He cut his water ration to a cup a day, and a fortnight passed before he was able to catch a quart of rain-water in a sail. Then he contracted fever and was too listless to pick up the flying fish that flopped on to the deck during the night. When he recovered he threw the cask of salt beef overboard. He was successful in catching fish, dangling his feet in the water to attract them and then spearing them as they came near to inspect. Not until August did he meet heavy rain, and this yielded him ten gallons of water. The fish diet then gave him a mild form of fish poisoning, and he had to restrict that type of food. THE YACHT that sailed round the world. The cutter Firecrest, in which Alain Gerbault sailed round the world alone, taking some six years to accomplish an astounding feat of endurance and navigation. In his 39 ft boat, which was over thirty years old, the French navigator sailed more than 40,000 miles. His course was from east to west. Gales swept the yacht as she sailed through the hurricane belt. On one occasion Gerbault had to climb into the rigging to get out of reach of a sea that broke aboard the Firecrest, burying her deck under tons of water. The sea broke the bowsprit and caused part of the rigging to give way, so that the mast was in danger. To add to his troubles, both the stoves were out of action, and he considered running for Bermuda, the nearest port. After having had some rest, however, he set to work on one of the stoves and obtained a hot meal. He then repaired the rigging and his broken bowsprit. After this he was determined to make for New York, which he eventually reached 101 days out from Gibraltar. Gerbault then went to France, leaving the Firecrest in New York. He returned to her in 1924, to fit her out for the passage to the South Seas. The refitted Firecrest was a great improvement on the old ship. She had a new Oregon pine bowsprit, new standing rigging, new sails, a water tank holding forty-four gallons, a bronze bobstay, a hollow boom and a new roller-reefing gear. The original gaff mainsail was replaced by a triangular one. Among the stores were a bow and arrows for shooting fish, rifles, a mile and a half of film and a library of books. Sailing from New York in November, Gerbault met bad weather almost from the start. On November 5, when he had not seen a vessel for two days, he saw that his port light was out, and went-below to light it, but stopped to prepare a meal. He was filling the lamp when a steamer scraped the bowsprit of the Firecrest. Hastening on deck, Gerbault saw her lights as she continued on her course, evidently unaware that she had scraped the yacht, which she had probably not seen in the darkness. The force of the blow tore the bitts out of the foredeck of the Firecrest and broke the forestay and the jibstay, so that the mast threatened to go at any moment. Gerbault carried out temporary repairs, but had an anxious time in the gales that battered the yacht before she anchored in the harbour of St. George, Bermuda. Thus, in spite of his elaborate fitting-out in New York, the accident of the collision and the effect of the gales on the crippled yacht reduced her to a sorry state in little more than a fortnight. As he had set out before stretching his new sails the gales had spoiled the set of the mainsail, and he had to have that recut. Much of the work done in New York had to be done all over again in Bermuda. One expensive job was the re-caulking of the hull, which meant that the copper sheathing had to be raised and then put into place again. Gerbault had been in France while his yacht was being refitted in New York; but in Bermuda he was on the spot, supervising the work and seeing that it was done to his satisfaction. Repairs took about three months. Gerbault then sailed for Colon, the Atlantic entrance to the Panama Canal, which he reached without mishap. He was towed through the Canal, and spent some time at Balboa, on the Pacific side. 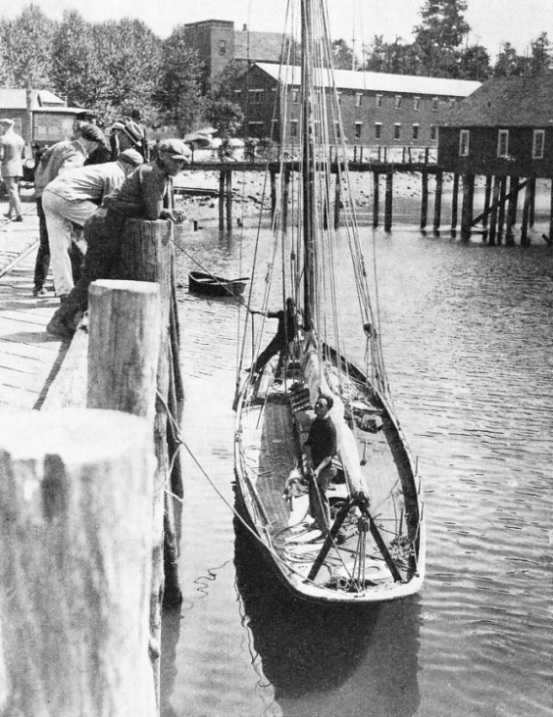 Here he met Harry Pidgeon, a Los Angeles photographer, who was on the concluding stage of a single-handed voyage round the world in the yawl Islander, only 34 feet long, which Pidgeon had built himself. He was the second man to sail round the world alone. Gerbault’s next stage was from Panama to the Galapagos Islands. Because of the medley of currents and the fickle and light winds the voyage from Panama to the Galapagos Islands is one of the most tedious stretches of water for a sailing vessel. On one occasion Gerbault had sailed 450 miles through this stretch of water in about a fortnight, but because of the adverse current he had travelled only five miles. Then he managed to creep south to Malpelo Island, an isolated rock 300 miles from the mainland of South America, and slowly forged ahead out of the northerly set of currents. At last, thirty-seven days out of Panama, he reached Chatham Island, in the Galapagos, some 800 miles from Panama. Here he obtained water and fruit, and prepared for the long sail of 3,000 miles to the Gambier Archipelago. The fresh trade wind enabled the Firecrest to start off with good daily runs, one being of 144 miles. A bonito weighing 35 lb leapt out of the sea aboard the Firecrest, providing a number of meals. But except for this and for a few flying fish that fell on deck and some dolphins that Gerbault harpooned, he lived on rice, porridge, biscuits and potatoes, finding that he kept in good health on a vegetarian diet. 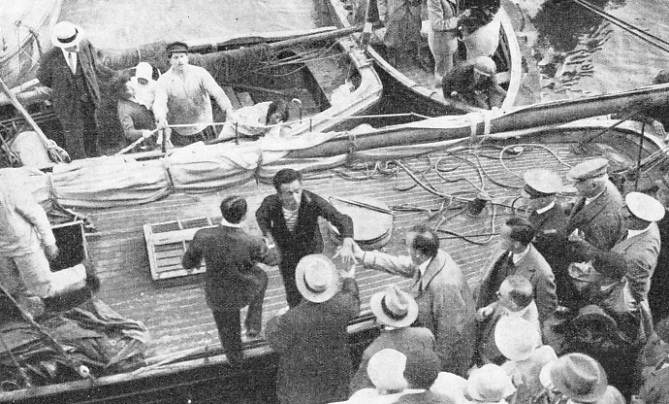 ARRIVING AT LE HAVRE in July, 1929, at the end of his spectacular voyage. Gerbault avoided a constant watch on the tiller since he found that if he furled his mainsail, set the trysail and trimmed the jib in flat, the Firecrest could hold her course. This picture shows the cutter being towed to a landing stage. Gerbault ran south, losing the trade wind in a week of calm. When the wind returned the rigging was in such a bad state that several mishaps happened almost at once. A backstay went and so did both topping lifts and six mast-hoops, and the oak tiller snapped. After, forty-nine days at sea Gerbault anchored in the harbour of Rikitea. In the months he spent with the natives Gerbault learnt their language, and then sailed 1,000 miles north to the Marquesas, where he again made many Polynesian friends, becoming more and more friendly with them. He sailed on to the coral islands of the Tuamotu group, and so to Tahiti. His attitude to the officials was to avoid them, and he says that he was- almost as solitary living aboard the Firecrest in the harbour of Papeete as when he had been at sea; but he made many friends among the natives. When he sailed to Bora Bora, an island near Tahiti, he became friendly with the officers of British and French naval sloops. It was at Wallis Island that Gerbault had the misfortune to be blown on to a reef while at anchor. He had previously lost his anchors and had borrowed one, which failed to hold the yacht in a gale. The Firecrest knocked off her lead keel on the reef, and Gerbault was swimming to the shore when, relieved of the weight of the keel, the Firecrest floated over the top of the reef and followed him to the beach, digging a berth for herself in the sand. Wallis Island consists of an island and a number of islets surrounded by a lagoon which is enclosed by a coral reef. Gerbault entered this lagoon by a passage in the wall of coral. The Firecrest was wrecked on a reef in this lagoon and went ashore, without the lead keel, on the beach of the main island. About 5,000 Polynesians lived on the island, but there were no shipwrights or smiths. The first thing Gerbault did was to right the Firecrest. He took all the ballast out and moved his personal belongings to the homes of friends ashore. With the aid of natives the yacht was righted and shored up. The lead keel was uncovered by the tide, which left the reef at low water. A lighter was floated over the keel at high water, and the keel was lashed to the bottom of the lighter and floated by this means to the beach near the hull of the yacht. Gerbault replaced his belongings aboard the Firecrest and lived in the yacht while he waited for aid from civilization. His chief concern was to obtain new bolts for the keel. After many weeks a steamship having a forge aboard entered the lagoon, and the chief engineer forged two iron bolts and made four bronze bolts out of an old propeller shaft. After several failures the keel was placed in position by shifting it into the water and floating the hull over it. Two Chinese, however, who were the only artisans on the island, made the holes in the wooden keel so large that when the tide rose the water leaked in at an alarming rate. At this stage the French naval sloop Cassiopee, sent to aid Gerbault by the French Minister of Marine, arrived. Before long her crew had fixed the keel firmly in position. During his stay of some months Gerbault had become so popular with the islanders that they asked him to stay and be their chief, but when the Firecrest was repaired he put to sea. On arriving at Suva, in the Fiji Islands, he had the Firecrest hauled up on a slipway, and further repairs were made. After having left Fiji, Gerbault put in at various islands and reached New Guinea, and then passed through the Torres Strait, north of Australia. He nearly came to grief in the reef-strewn waters when his anchor chain parted, after he had lost his kedge anchor because of the hawser snapping. Without an anchor, he was relieved to see a native sloop, and when he hailed the men they offered to tow him to Coconut Island. He took the tow-rope, and several natives came aboard; these men were alarmed when the Firecrest heeled over in the-brisk breeze, as they were not- familiar with this habit of narrow, deep-draught yachts. IN PARIS. A picturesque view of the yacht Firecrest moored on the River Seine, with the Eiffel Tower in the background. After his amazing trip, the French mariner published the story of his adventures and sailed back alone in another yacht to the Pacific Islands where he lived among the Polynesians, whose company he found congenial. Cocos-Keeling Islands, where he saw the remains of the famous German raider Emden. Gerbault then sailed across the Indian Ocean to Rodriguez, and for the first time trusted himself to a pilot. The Firecrest touched the coral in a narrow channel, the pilot not realizing that a deep-keeled yacht carries considerable way on her. At the next island, Reunion, he had various ironwork repaired, which was a wise resolve, as the passage to Durban was a rough one. It was even rougher to Cape Town, where Gerbault dry-docked the Firecrest, finding that teredo worms had eaten away part of the rudder stock. His next stages were St. Helena and Ascension Island, and the passage from Ascension to the Cape Verde Islands brought trouble. He crossed the Equator and slowly worked north up to the islands, but was baffled by bead winds when near them. Porto Grande, the chief harbour in the group, is in the island of St. Vincent, which is separated from the island of St. Antonio by a channel a few miles wide through which the trade wind blows with some force, raising a strong current. Instead of standing clear of this by going round St. Antonio, where he would have had ample sea room, and turning to approach Porto Grande from the north, Gerbault made many attempts at the channel; thus he became tired out. The wind fell light, and he slept, to be awakened by a slight shock as the Firecrest stranded on a reef a few yards from the beach of St. Antonio, where the current had carried her. Gerbault’s activity in getting ashore and locating a village when he realized that nobody had seen his plight saved the Firecrest, as the weather remained fine long enough for her to be taken off. A hole had been knocked in her side, but this was plugged, and, with a crew manning a line of buckets to keep her afloat, she was towed across the channel to Porto Grande. She was repaired and Gerbault sailed, but she leaked so badly that he turned back and decided to stay at St. Vincent for some months, superintending repairs and writing a book. When he left for the fast time it was obvious to him that the Firecrest would not last much longer; she leaked, compelling him to work hard at the pump to keep her afloat. He put in at the Azores and then sailed on the last stage of the long voyage, arriving at Le Havre in July, 1929. More than six years had elapsed since the Firecrest had sailed from Cannes, and she had covered more than forty thousand miles. Gerbault proved himself a skilful navigator, but was less happy with his gear. He was hampered by having to start with an old boat. Such a voyage is hard on a little yacht which was over thirty years old when she had left France. Slocum and Pidgeon sailed in new boats. Despite the hardships of life in a small yacht, Gerbault had energy to spare for tennis and football when he went ashore in tropical ports. Twice wrecked, he patched up the Firecrest and completed the voyage when a man of less persistence would have admitted defeat. Physical fitness served Gerbault in good stead on many occasions. When the yacht had stranded at a desolate spot on St. Antonio, he half-ran and half-walked over broken country under a hot sun without the least fatigue, although he had had little rest for four days. Then he worked hard removing gear from the yacht and gave a cinema entertainment to the islanders who had come to his aid; not until then did he think about sleep. Gerbault’s determination and his physical fitness were outstanding features of a wonderful voyage of circumnavigation. AN ENTHUSIASTIC CROWD thronged the quay at Le Havre to greet the solitary yachtsman when he landed in France. This photograph shows the adventurer being helped from his vessel by some friends. During the last stages of the voyage from St. Vincent (Cape Verde islands), Gerbault had not only to work his yacht alone, but also to labour at the pumps to keep her afloat, as she was in such a poor condition. You can read more on “Captain Slocum the Pioneer” and “Pidgeon and the Islander” on this website.